Isador Straus was born in Rhenish, Germany, on 6th February, 1845. His family, persecuted as Jews, emigrated to America in 1854. After leaving school he joined his father, Lazarus Straus, in his dry goods business in Talbotton. After the Civil War Straus moved to New York. 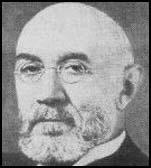 With his brother Nathan Straus he became a partner in the R. H. Macy department store in 1888. Straus served in the House of Representatives (1894-95). Straus and his wife, Ida Straus, lost their lives when the Titanic sunk in 1912.